You will first be asked to complete several forms providing us basic information about you, your eyes, any medical problems, and your insurance coverage. In addition to the name of the eye doctor who referred you to us, we would like the name, address and phone number of your family or general medical doctor. Our staff will assist you in completing the forms if necessary. When your registration has been completed, you will be directed from our reception area to our examination area. 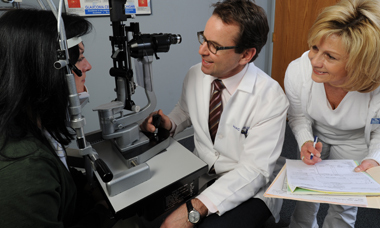 One of our ophthalmic technicians will review the reason for your consultation and take some preliminary measurements of your eyes and your eyesight. Then you will see the doctor, who will evaluate your eyes. Following that, you will have a visual field test which checks your peripheral vision. The technicians may instill eye drops to dilate your pupils. Dilation of the pupils is usually necessary in order to completely examine your eyes. It takes about 20 to 30 minutes for your pupils to fully dilate after the drops have been given. When your pupils are fully dilated, you will again be examined by the doctor. Do not hesitate to ask questions about your eye condition or its treatment. Depending upon the nature of your problem, additional tests will be performed the same day as your consultation. A complete report of your consultation and any test results are sent to both your eye doctor and general medical doctor.